Robert Pierson, shortly before being illegally detained by Deputy Corry Bassett. 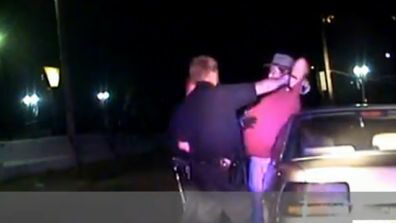 Thus spoke Deputy Corry Bassett of the Lincoln County, Wyoming Sheriff’s Office as he struggled to justify handcuffing Robert Pierson during an August 11, 2011 traffic stop. Pierson, a Marine combat veteran, had been riding his motorcycle near Alpine when another motorist called to complain about a biker passing a number of slow-moving motor homes. Pierson was not charged with a traffic violation or a criminal offense -- but he was arrested and detained in handcuffs for 45 minutes because the sight of a Mundane carrying a firearm caused Bassett to irrigate his underwear. The second statement is an unalloyed lie: Whenever a police officer restrains someone, that person is under arrest. The first statement is a lie by omission: If Pierson had been a police officer, Bassett would not have complained about him carrying a gun. The category of “someone” thus applies only to Mundanes, whose very existence is seen as a threat to the unimaginably precious personages who wear state-issued costumes. “It’s the first thing you should have told me, [that] you’ve got a gun,” simpered Bassett, whose panic-tinged voice was thrown into sharp relief by Pierson’s composure. “Well, actually I’m not required to tell you in either Idaho or Wyoming,” Pierson correctly pointed out. “My only concern is my personal rights and individual liberties, which you are violating right now,” noted Pierson. “No, I am not,” Bassett lied. “You have me handcuffed,” Pierson reminded the increasingly petulant officer. “You asked me if I could get off my bike, and you said `yes,’” recounted Pierson. The same could have been said by Pierson about Bassett, who was, after all, just another armed stranger. One critical difference, of course, is that Pierson knew that Bassett’s intentions were malign: After all, the deputy had detained him, which is an act of aggression by any definition. Recall that when Bassett noted that Pierson had a gun, his first question was: “Are you a cop?” If Pierson had been a fellow member of the Brotherhood of Official Plunder, this would have allayed Bassett’s concerns. In fact, after noticing that Pierson carried a military ID, Bassett suggested that the detainee should see the encounter in terms of “force security” in a battle zone. Bassett, who never served in the military, clearly saw himself as part of an army of occupation – and insisted on unqualified submission to his supposed authority. “Your safety does not trump my right and my liberty,” Pierson tutored the deputy. “When I stop you, yes it does,” asserted Bassett. “Your personal safety is more important than all the laws, the Constitution, and every one of my personal rights and liberties,” summarized Pierson, his voice heavy with disgusted incredulity. “The Constitution is in control of this situation,” Pierson rejoined. “No – I am… and if I feel that I’m going to be threatened by the fact that you have a gun on your side, by hell I’m gonna do it,” concluded Bassett. Pierson didn’t agree to those terms. Eventually a patrol supervisor reached the scene and acknowledged that the motorcyclist had done nothing wrong. Until that happened, however, Pierson was handcuffed, disarmed, and entirely at the mercy of two armed strangers who considered it their right – if not their duty – to kill him if he displayed any behavior that made them uneasy. In the sacred cause of “officer safety,” no precaution is excessive, no imposition unjustified – and no constitutional “guarantee” of individual rights is binding. Pierson’s legitimate concern for citizen safety in the presence of police is underscored by an incident that occurred near Canton, Ohio just weeks before the traffic stop in Wyoming. On June 8, 2011, Patrolman Daniel Harless of the Canton, Ohio Police Department, repeatedly threatened to murder the driver, William E. Bartlett, for carrying a concealed handgun for which he had obtained the appropriate permit. At all times, Bartlett was composed and cooperative. He made every effort to comply with the Ohio concealed carry ordinance by notifying Harless that he was carrying a weapon, and displaying his concealed carry license. He was rewarded with a profane outburst in which Harless made it clear that he was eager for a chance to kill somebody. Unlike Harless, who was obviously deranged, Bassett and Andazola did not dissolve into puddles of psychotic rage. But lurking behind their veneer of “professionalism” was a willingness to commit homicide simply because the sight of a Mundane with a firearm made them feel kind of funny. What about "citizen safety"? Deranged Fed threatens to murder acitizen over a protest sign. “It always amazes me how in situations like this, one side gets out very quickly, and it’s not ours; that’s really frustrating,” Stetzenbach complained. In this case – as in other “situations” of its kind – the officers have themselves to blame for the fact that the public hasn’t seen “their side” of the story, since the dashcam recordings of the encounter have mysteriously disappeared. The victim documented the incident, and the chief assailant has confirmed all of the victim’s key assertions. Res ipsa loquitir. Remember that admission next time you’re told that the police are here to protect and serve the public. If you can spare a few bucks, please help me keep Pro Libertate on-line. Regina Tasca at the Borough Council meeting dealing with her termination. Regina Tasca, a 20-year veteran officer from Bogota, New Jersey, was terminated by the Borough Council on September 21. This decision came after a lengthy investigation into her purported misdeeds. Prior to her termination, Officer Tasca had never generated a single citizen complaint or official reprimand. She was being considered for promotion before she got in trouble in April 2011. What horrible deed led to Officer Tasca's dismissal? Before answering that question, it’s worth reviewing a few recent cases of severe police misconduct that either went entirely unpunished, or resulted in sanctions short of termination. Lawrenceville, Georgia Police Chief Randy Johnson refuses to fire Detective Tim Ashley, an abusive cop with a nasty habit of imprisoning innocent people – a habit that has already cost the local taxpayers a great deal in legal expenses. Among his victims is Ann Jaipersaud, who operates a Chevron station in Lawrenceville. When Jaipersaud found herself dealing with an aggravated customer, she made the common – and by now inexcusable – mistake of calling the police for help. As is always the case, matters immediately got much worse after the police intervened in the dispute. The customer, an American of African ancestry, apparently thought that the store owner (a woman of East Indian descent who was born in Guyana) didn’t want to sell him gas on account of his ethnic background. When told that the station had no gasoline, the customer — who verbally abused the store owner — refused to leave. Jaipersaud’s call was answered by five officers, including Detective Ashley. After the customer claimed that Jaipersaud had struck him, she pointed out that the store’s security video would prove that she had done no such thing — but she didn’t know how to access it. Ashley demanded that she call her son, who was at school. “He said I need to get him here now or else,” Jaipersaud recalled. “I asked him if he was threatening me…. And he said, `No, I’m arresting you.’” The officer later explained that he arrested Jaipersaud for being “disrespectful.” She spent ten hours in jail for what was later determined to be a wrongful arrest. A jury awarded Jaipersaud nearly $140,000 in damages. Detective Tim Ashley abducts Jaipersaud (right). Lawrenceville tax victims will almost certainly forced to indemnify Ashley’s crimes against 29-year-old Mississippi resident Carlos Fairley, who was abducted by police in a SWAT-style raid and then spent two months behind bars as a result of the detective’s culpable disregard for evidence. Last November, Fairley — who was earning an honest living as a cook at a casino — tried to obtain a more lucrative position in the plunder-based sector by applying for a position with the Transportation Security Administration. A background check by the agency found that Fairley had outstanding arrest warrants in Lawrenceville for two counts of armed robbery. In any case, Fairley was told he had to clear up the warrants before being considered for employment with the TSA. When he called the Lawrenceville PD to inform them that he had not so much as visited Georgia for nine years, “Ashley `loudly and rudely’ said he knew Fairley committed the crime and hung up on him,” recounts the Atlanta Journal-Constitution. The warrants were issued on the basis of a photo lineup that included a picture of Fairley when he was booked after being arrested as a teenager roughly a decade ago for “joyriding” in a stolen vehicle. Furthermore, the eyewitness testimony described the robber as having a face disfigured by several tattoos; Fairley’s face is unmarked. This difference should have been obvious even to a specimen like Tim Ashley. A few weeks after he contacted Ashley, Fairley was seized in a guns-drawn police raid in Mississippi and extradited to Georgia, where he was imprisoned for three months. As an out-of-state defendant accused of a violent felony, Carlos wasn’t going to be granted bond even if is family could afford it, Carnell observes. In addition to having two months of his life stolen from him, Carlos now bears the all but ineffaceable taint of the fraudulent arrest. Ashley, on the other hand, enjoys perfect job security despite numerous suspensions for misconduct – including a threatening phone call to his ex-wife’s boyfriend, and refusing to respond to a homicide call while on duty. Not surprisingly, Fairley has filed a lawsuit against Ashley and the department that employs him. That lawsuit — and the needless abuse of Orlando Fairley — could have been avoided if Ashley had invested a minimal effort in trying to identify a legitimate suspect, rather than pursuing what appears to be a mission to punish Fairley for impudently asserting his innocence. Regina Tasca has been responsible for supervising prisoners, but there is no evidence that she ever imprisoned anyone on false pretenses, or arrested a citizen for petty or vindictive reasons. German Bosque, a Sergeant in the police department terrorizing Opa-Locka, Florida, has been the subject of 41 internal investigations, more than a dozen of them in cases involving battery or excessive force. He was found with counterfeit currency, crack pipes, and cocaine in his police vehicle. On several occasions, Bosque has been accused of domestic violence, stalking, and stealing a car. One of his preferred tactics is to “tune up” – that is, assault – youngsters if they display what he considers “disrespect” toward the police. Bosque has been arrested three times. He has also been fired five times -- and immediately re-instated with the help of the local criminal’s lobby (more commonly known as the police officers’ union). He is safely ensconced in a $60,000-a-year job as a state-licensed thug. 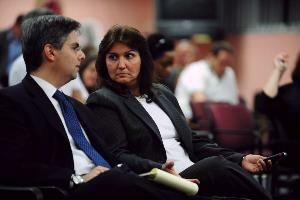 Officer Regina Tasca was never accused of abusing anybody. As noted above, she has never received a single citizen complaint. The City of Scottsdale, Arizona faces a lawsuit by the daughter of John Loxas II, who was fatally shot by Officer James Peters, a former SWAT operative previously involved in six fatal officer-involved shootings. Peters killed John Loxas II on February 14. At the time, the 50-year-old grandfather was holding a seven-month-old baby. The Valentine’s Day incident began in similar fashion. The police were summoned by a report that Loxas had kicked a neighbor’s garbage can into the street while he was on a walk with his nine-month-old grandson. When police arrived they found him outside his home. Ordered to “step away” from the house, Loxas retreated inside. Without any evidence that Loxas intended to harm the child, the officers created a “crisis entry team” — that is, they escalated the conflict by imposing a military protocol that led to the summary execution of a man who wasn’t suspected of a violent crime. Although Loxas was treated as if he were a heavily armed barricaded kidnapper, a search of his home turned up a total of two firearms — neither of which was within easy reach when he was killed by Officer Peters — and an object described as a “functional improvised explosive device” that was disposed of by a bomb squad and not inspected by any independent party. While Loxas’s behavior and statements were considered troubling by some, it was Peters who clearly posed a danger to himself and others. During his 12-year career, Peters was involved in seven shootings, six of them fatal. His personnel record is replete with complaints about excessive force, including “dozens” of episodes involving Tasers. In 2005, he was disciplined for pointing a gun at his own head. In Houston, four police officers were recently suspended for engaging in a scheme to embezzle overtime pay by falsifying traffic tickets. Over the past four years, the officers had fraudulently collected almost one million dollars in overtime. 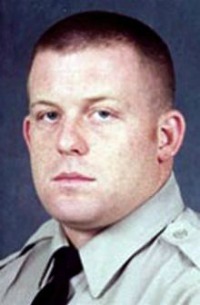 One of them, Senior Officer Matthew Davis, soaked up $347,000 in 2008 alone. Davis had previously been suspended for improperly dismissing tickets at the request of a City Council member. Davis received a 30-day unpaid suspension, as did fellow Officer Steven Running. Senior Officer Kenneth Bigger was handed a 20-day suspension. The sternest punishment – if the term could be applied here – was imposed on Sergeant Paul Terry, who was suspended for 45 days. By any rational standard, embezzling a million dollars is a serious crime. Yet none of the officers involved in that felonious conspiracy faced criminal charges. None of them has been required to make restitution. None of them was fired. Accordingly, it would be reasonable to expect that Regina Tasca’s firing offense would be more serious than defrauding Houston’s tax victims out of a million dollars. As it happens, her offense had nothing to do with corruption of any kind. On September 22, a Houston Police Officer named Matthew Jacob Martin shot and killed 45-year-old Brian Claunch, a one-armed, one-legged man in a wheelchair who was “armed” with a pen. The victim was an emotionally disturbed man living in a group home for the mentally ill. The caretaker made the reliably fatal mistake of calling the police. According to Houston PD Spokeswoman Jodi Silva, the shooting was justified because Officer Martin, who was supposedly “trapped” by Claunch, feared “for his partner’s safety and his own safety” despite the fact that they were both young, able-bodied, armed individuals confronting an invalid in a wheelchair who was armed with a writing utensil. The killing of Brian Claunch, which was not Officer Martin’s first shooting, precipitated a huge public outcry, and the Police Chief has called for a Justice Department investigation. On previous performance it is all but certain that Martin will not be prosecuted, nor is it likely that he will suffer injury to his career. It so happens that the incident that led to Regina Tasca’s firing offense also involved an emotionally disturbed and unarmed individual who was perceived as a threat to officer safety. Did she shoot and kill the subject, or use disproportionate force in subduing him? Career-ending nobility: Tasca stops Rella's assault. No. 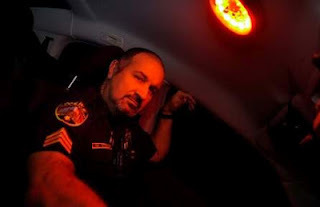 As the officer in charge of the situation, Tasca followed the Bogota Police Department’s use-of-force policy to the letter by intervening to protect the victim from a criminal assault committed by an officer from another department. As Officer Tasca summarized the matter in an interview with Pro Libertate last spring: “I didn’t fail to aid another officer; I acted to stop a beatdown.” Tasca interposed herself to stop Sgt. Joe Rella’s assault on 22-year-old Kyle Sharp, an emotionally troubled young man who had done nothing to justify police violence of any kind. About two days after the episode, Tasca was labeled a “danger” to her fellow officers and suspended by the department. Following a year of disciplinary reviews, psychological evaluations, and a spurious legal process worthy of the Soviet Union, Tasca was fired. Tasca was on patrol on April 29, 2011 when she got a call for medical assistance. Former Bogota Council Member Tara Sharp, concerned about the erratic behavior of her son Kyle, called the police to take him to the hospital for a psychological evaluation. As noted earlier, requesting police intervention, particularly in cases of this kind, is never a good idea. Sharp was exceptionally fortunate that Officer Tasca was the first to respond: She has years of experience as an EMT and had just completed specialized training on situations involving psychologically disturbed people. Once on the scene, Tasca acted quickly to calm down the distraught young man, whose mood changed abruptly when he saw the other officers arrive. The official report on the matter, which was written by retired Judge Richard Donohue, claims that Kyle “was aggressive [and] started to walk away….” Only someone incurably inhospitable to both logic and honesty would describe walking away as “aggressive” behavior. Kyle also instructed the police not to step on his property, which was a lawful order the police were required to obey. Instead, Sgt. Chris Thibault tackled Kyle, wrapped him in a bear hug, and attempted to handcuff him. Within an instant, Sgt. 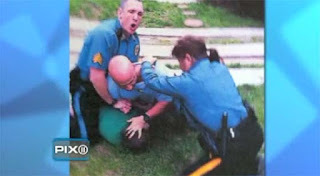 Joe Rella piled on and began to slug Kyle in the head while his horrified mother screamed at the officers to stop. No, really. That’s what Thibault said, under oath, during Tasca’s disciplinary hearing. Only an uncommonly inventive sophist would pretend that the important question is whether Tasca was aware of the document stating the policy, rather than whether her actions were in accord with that policy. Earlier in the same month, Tasca had prompted criticism for failing to rush to the aid of her partner, Officer Jay Fowler, during a brief confrontation with a tiny, drunken woman at a hospital. The woman, who was not a criminal suspect, was taken to the hospital for medical attention. She decided to leave, and when Fowler – who had already surrendered custody to the hospital – tried to stop her, the young woman “flailed” her arms, inflicting a small scratch on one of Fowler’s hands that tore open an old scab. As a result of this “altercation” with a woman whom he outweighed by about 100 pounds, Fowler spent a week on paid medical leave, according to Donohue’s report. “Nobody had said anything to me about the earlier case until after the incident with the Ridgefield officers,” Tasca pointed out to me. Her refusal to gang-tackle a tiny, confused woman in a hospital, coupled with her active intervention to stop a criminal assault on an unarmed, mentally unbalanced man who was not a criminal suspect, supposedly established a “pattern” of behavior that made Tasca a danger to her fellow officers. This purported dysfunction, once again, wasn’t noticed until after Tasca displayed the character and integrity to take the morally appropriate action – one dictated by the official guidelines of her department – in defiance of pressure from her peers and superiors to conform. Tasca, an openly gay female police officer, believes that at least some of the problems she’s experienced are the product of a cultural clash with what she describes as “the Old Boys Club.” Judge Donohue’s report mentions two instances in which she was criticized by for not extending what is euphemistically called “professional courtesy” by writing traffic citations against another officer. Despite such frictions, Tasca’s job appeared secure – until the moment she behaved like a peace officer, rather than a law enforcer, and crossed the “Blue Line” by coming to the defense of Kyle Sharp. Fidelity to the tribal interests of the punitive priesthood will cover a multitude of crimes, but taking the side of a Mundane being attacked by a member of the Brotherhood is an unpardonable offense.